This is a comparison of two pairs of earbuds from Jaybird, a subsidiary of Logitech. Two models that they created are Jaybird X3 vs Jaybird Freedom F5 – high-quality headphones that are designed to be used in extreme conditions. Check out the similarities and differences between them to find out which pair of earbuds will suit you best. Freedom F5 is the most advanced Jaybird headphones – they weigh even less than Jaybird X3, which is already very light. Of course 2 grams don’t make much of a difference, but still, it’s a great achievement. When you compare F5 to any other earbuds, you can see how crazy small these things are. You can use them under your helmet while wearing glasses and these small buds won’t even get in your way. The X3 earbuds are the successor of X2. The new shape is different than before. A plastic from X2 was replaced by the same kind of plastic but it’s now silver and resembles aluminum. Both of them come with a set of additional fins and tips, which will help you keep your earbuds inside your ears. Fins are not necessary, but during the hard workout or running they can be very useful. The buds come with both the rubber tips in different sizes and foam tips that give you more sound isolation. Both models come with a special clip to shorten the cord behind your head. It will help you to keep a cable clutter in control. The remote control is about the same size as an AA battery. It has 3 buttons, but they work a bit different than with wired headphones. press once on upper or lower button to control the volume. press and hold for a second on upper or lower button to skip to the next/previous song. the middle button press pauses/plays music or answers a call. the middle button long press hangs up a call. the middle button double press redials the last number. the longer middle button push and hold turns off the headphones. Both headphones have similar parameters and sound quality, so there is not much of a difference here. When it comes to sound, you have to remember that these are very small earbuds with 6 mm drivers, so they won’t sound as good as over-the-ear headphones. Jaybird headphones happen to have one of the best flat sound signatures of any wireless pair of headphones. You can use Jaybird MySound that is available on IOS and Android and adjust the sound to meet your needs. You can think of the headphones as a canvas and the MySound app as paint where you can paint whatever you want. You can build your own shape of sound profile and save it, or pick one from a ton of free pre-built or community-based. In some cases, you can have more bass for EDM, or treble if you want to hear vocals or listen to classical music. Once you save your settings, the app knows everything about your headphones, their type, battery status and what sound signature they are using. I need to mention that once you create your custom sound profile, it will never get reverted back to the default settings even after pairing it with a different device. 6-millimeter drivers have a response to the bandwidth of 20 Hz to 20 kHz, so that’s a pretty good response range, especially if you listen to compressed music such as Apple Music, Spotify or Google Play. The sound quality is decent. You cannot expect much more from something that is Bluetooth and sweat-proof. To have the best experience with the headphones you have to seal up your ear canal very tightly. That makes the audio sound richer and fuller. Initially, the headphones lacked bass and sounded odd because of the settings they start with called ‘signature sound’. Be sure to change it with the app. After you do so the bass become punchy. Also, make sure your earbuds fit properly or they will sound the second rate. I use the foam buds and place them into my ear canals and I get great bass and a secure fit. After listening to different types of music on both earbuds I can conclude that crisp detailed treble and midrange instruments are accurately reproduced and the human voice is also faithfully delivered. I didn’t have many issues with both models, the connection stayed up to around 30 feet and there was only mild hiccup while exercising, but nothing major. The pairing was simple and I was able to connect to iPhone and Android after about 10 seconds. Both pairs of earbuds use the Bluetooth 4.1 standard. Now, you can connect two pairs of headphones to one device at the same time or a pair of headphones to two different devices. If you constantly switching between different devices, you don’t have to worry about disconnecting them every time. So far, both headphones were very similar. Now, it’s time to talk about a major difference between both devices – the battery. In many earbuds the battery is built into the earbud itself, in Jaybirds, it’s built into the controller. Despite Jaybird claims that both devices can work for about 8 hours on one charge, the situation it’s a little bit more complicated. 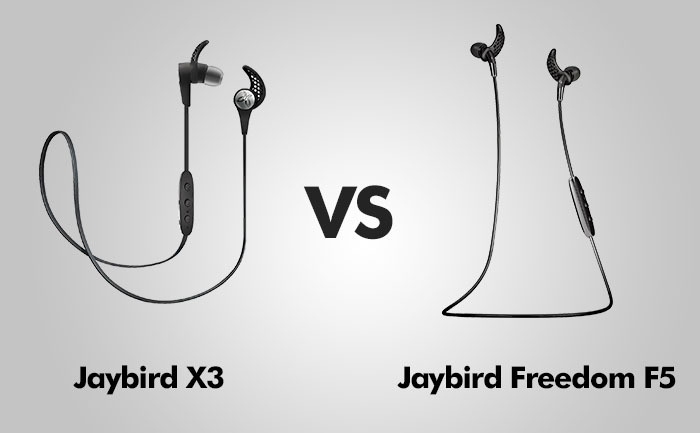 Jaybird X3 can last more or less 8 hours, but Freedoms lasts only 4. If you want to prolong the battery life in freedoms, you will have to add the special cradle that will increase the weight slightly. Now, you have an additional four hours with the charging cradle that has a small battery built into. The thing that can be considered either an upside or a downside is the charging mechanism. Instead of having a micro-USB input directly in earbuds, with Jaybirds, you have a cradle with pins that charge the devices. The disadvantage of this solution is that you have to carry both headphones and the cradle. But the cradle fits into the pouch with the earbuds so it’s not difficult to carry it around. Because both headphones are designed to be used in extreme conditions, like sweat and dirt, the advantage of the cradle becomes quite obvious. Now, no sweat or dirt will enter the earbuds through the micro-USB port, so there won’t be any problems with charging the battery. PROS: Good sound quality / MySound app / long battery life / Can connect to multiple devices at the same time / Sweat-proof. PROS: Good sound quality / MySound app / great design / Can connect to multiple devices at the same time / Sweat-proof. CONS: The design is not as premium as F5. CONS: Only 4 hours of play without the cradle. There are many similarities between these two models. The main differences are design and battery life. Freedoms also used to cost about 200$. Now, when a price dropped by half, they became cheaper than X3. The main difference between the two is the slicker design versus better battery life without the cradle. If the cradle is not a big issue for you – go with Freedoms, otherwise, choose X3.